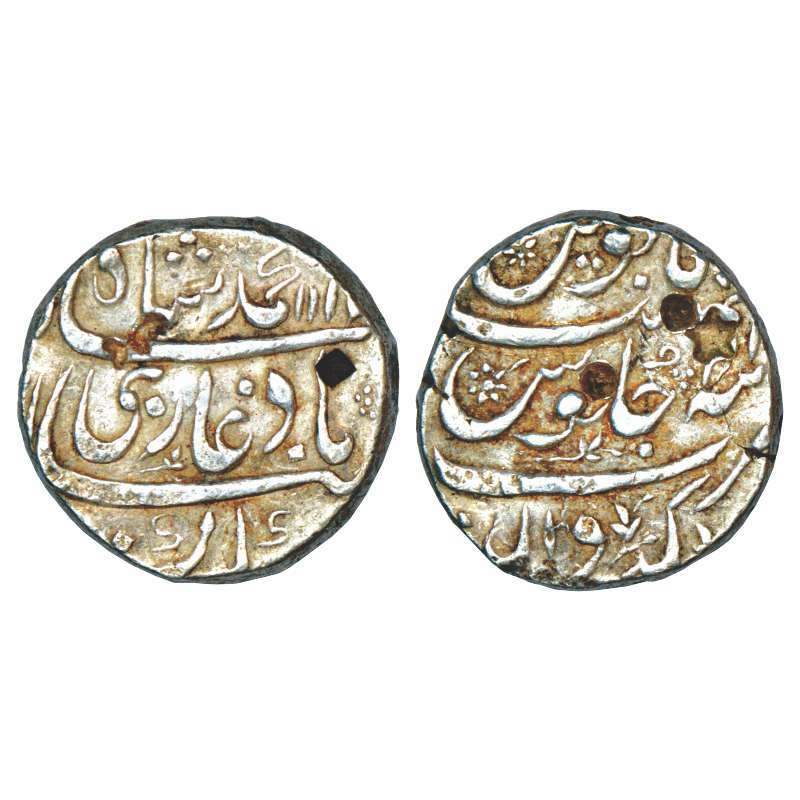 Nawabs of Arcot, Sa'adatullah Khan I (1710-1732), copper double cash in the name of Farrukhsiyar, Trichanapali /Farruknagar mint, 6.73g. 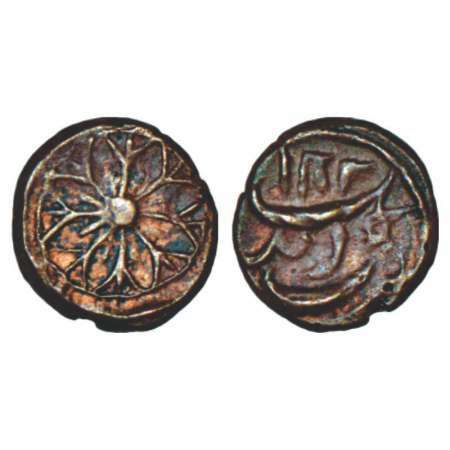 The reading of the mint-name on these coins is not certain. On some, the legend appears to be 'Tirchanapali', but on others a distinct 'shosha’ is visible to the left. 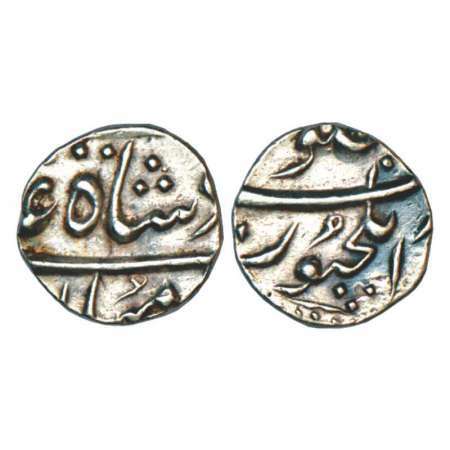 In terms of Farsi, orthography, all visible letters except the 'shosha' would fit both 'Tirchanapalli' and 'Farrukhnagar'. 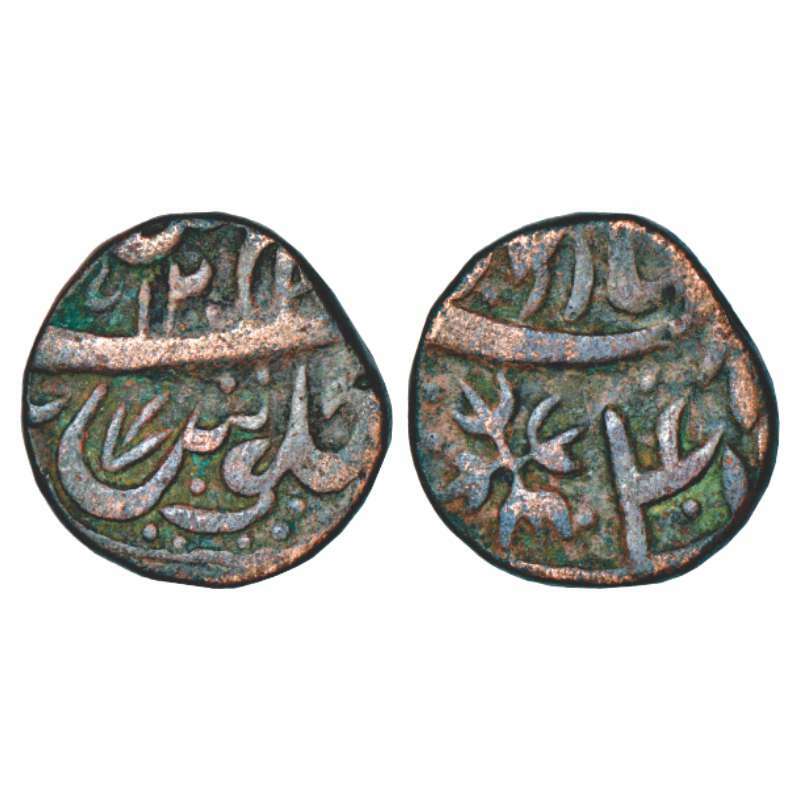 Nawabs of Arcot, Muhammad Ali (1749-1795AD), copper cash in the name of 'Wala Jah', AH 1201, 1.82g. Obv: Lion with gaping mouth standing facing right. Rev: Date and Wala Jah below it. 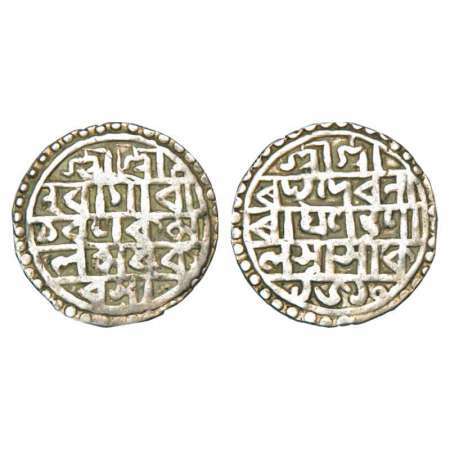 Cooch Behar, Nara Narayana (1555-1587 AD), silver tanka, Saka 1477, Bose KK A.1.51. 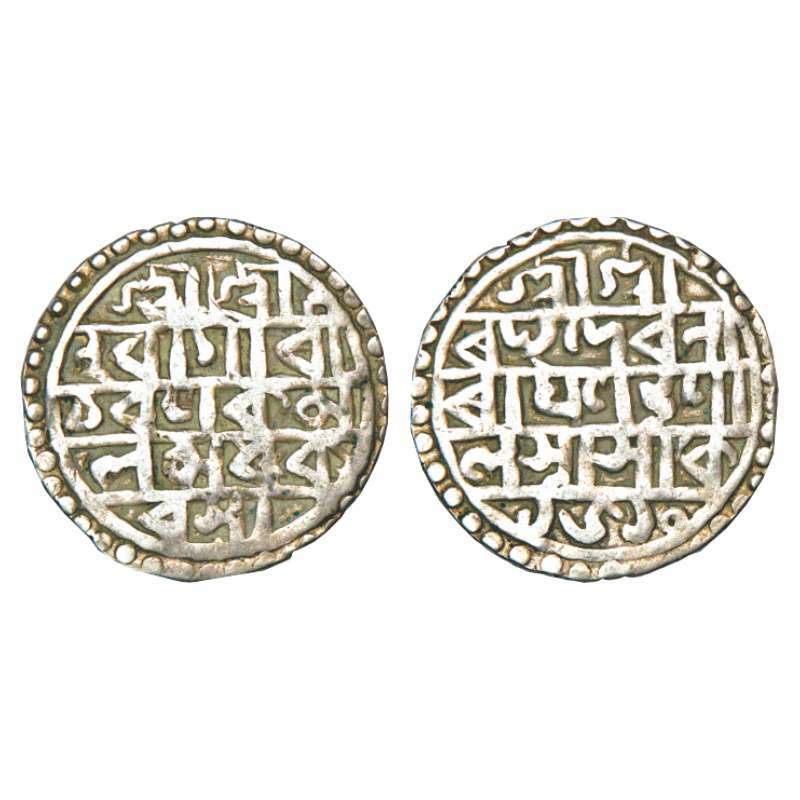 Cooch Behar, Raghudeva Narayana (1588-1603 AD), silver tanka, Saka 1510. Obv: Bangla legend Sri Sri/hara gauri/charanu Kama/la madhu Ka/rasya, within dotted border. Rev: Bangla legend Sri Sri/Raghudeva Na/rayanasya/Bhupa/lasya Saka/1510, within dotted border, Bose-KK C(E) 2.5-2.6. Nawabs of Cuddappah as vassals of Tipu Sultan of Mysore, copper cash, Kadiri mint, AH 1202, 1.47g. Obv: Lotus design. Rev: Mint name and date. 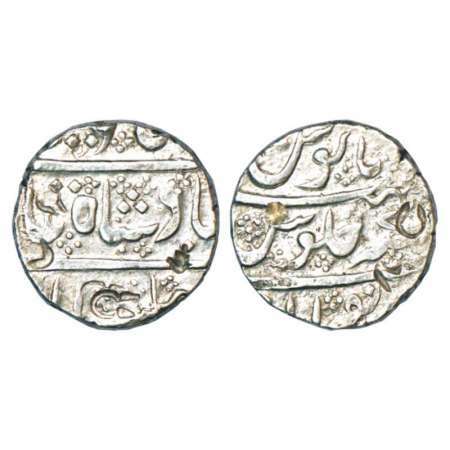 Farrukhabad, Ahmad Khan Bangash (1750-1771 AD), silver rupee, Ahmadnagar Farrukhabad mint, in the name of Alamgir II, AH 1172/RY 5, KM 12. 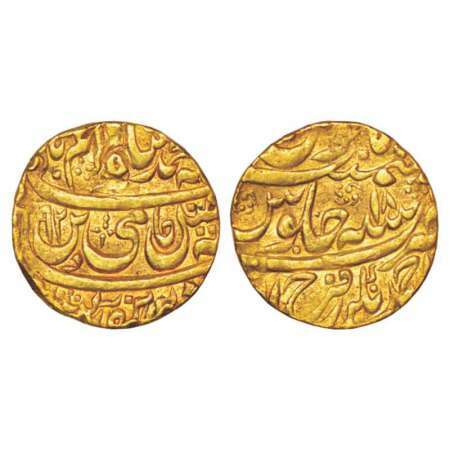 Farrukhabad, Ahmad Khan Bangash (1750-1771 AD), gold mohur, 10.67g, Ahmadnagar Farrukhabad mint, in the name of Shah Alam II, AH 1192/RY 18, KM 34. 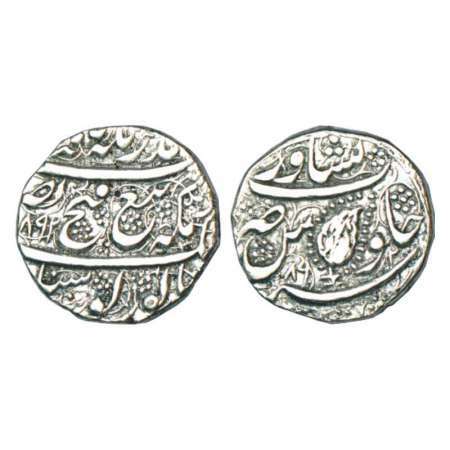 Nizams of Hyderabad, feudatory 'Samsthana' issues, silver rupee in the name of Muhammad Shah, Gadwal mint, RY 21(? 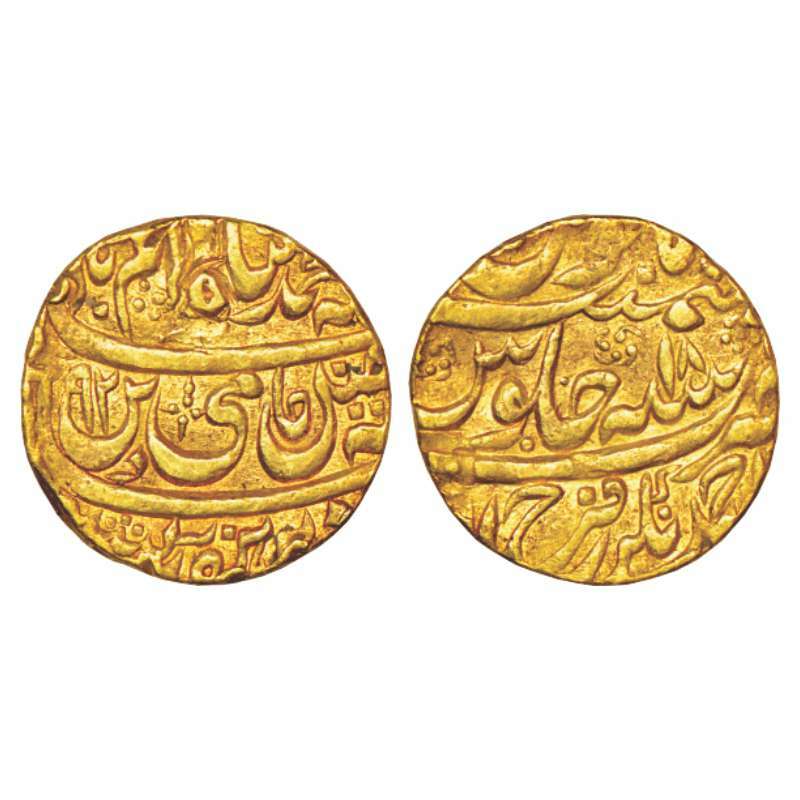 ), 11.47g. 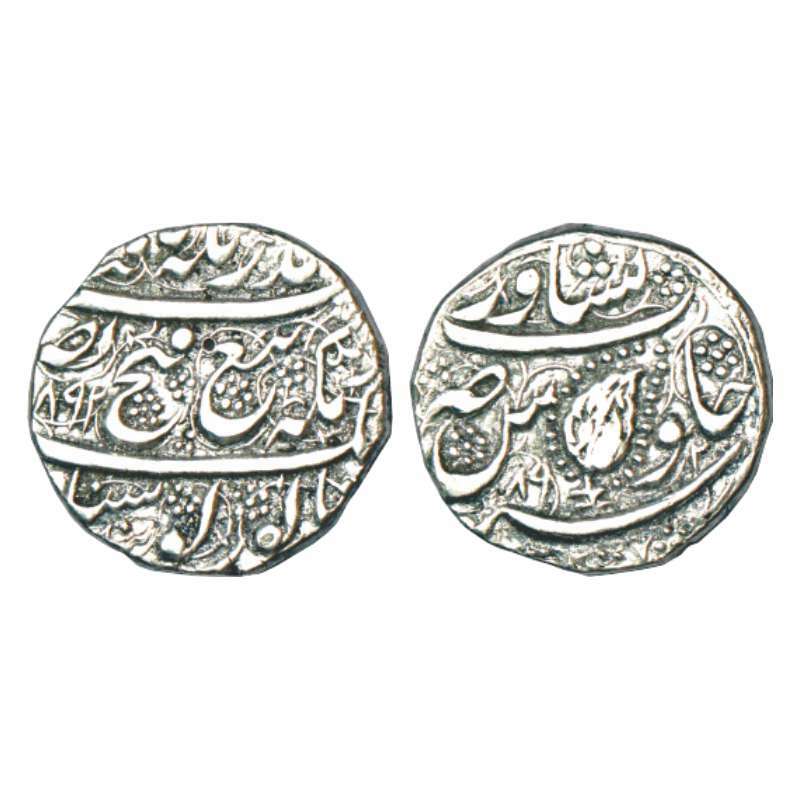 The Samsthana of Gadwal was one of the three important Hindu feudatory states under the Nizam of Hyderabad. In early 18th century its ruler, Somashekhara Ananda Reddy or Somanadri played an important role in securing its foundations. 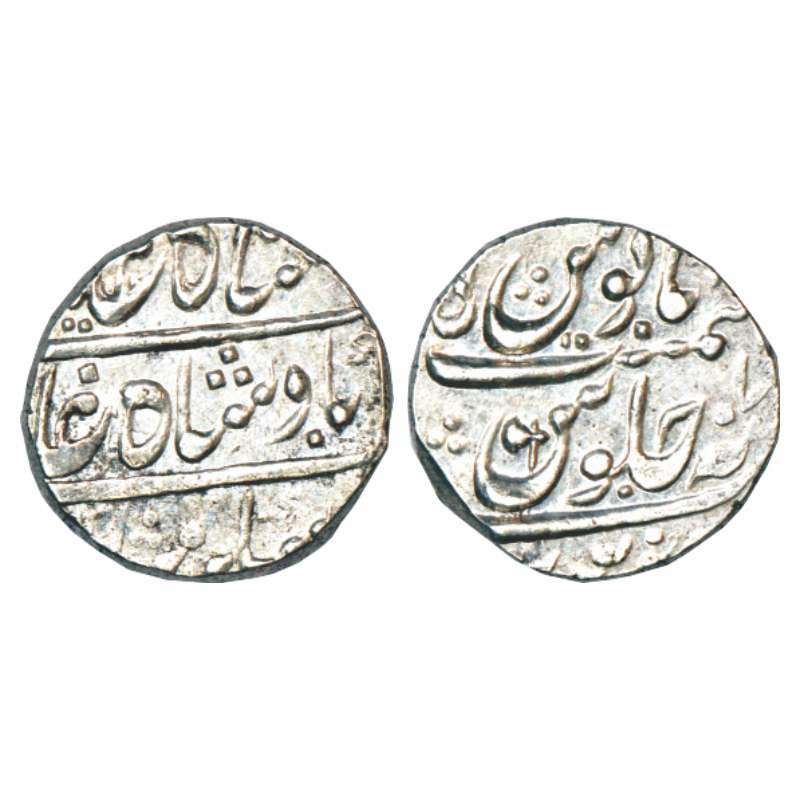 So far, it was thought that the mint at Gadwal became active only in the reign of Shah Alam II, producing local or 'Chulnee' coins. 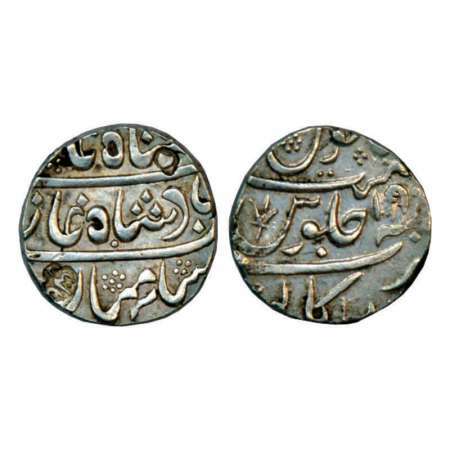 This is first ever known coin of Gadwal in the name of Muhammad Shah, and it puts the inception of the mint almost twenty years earlier than it was previously thought. 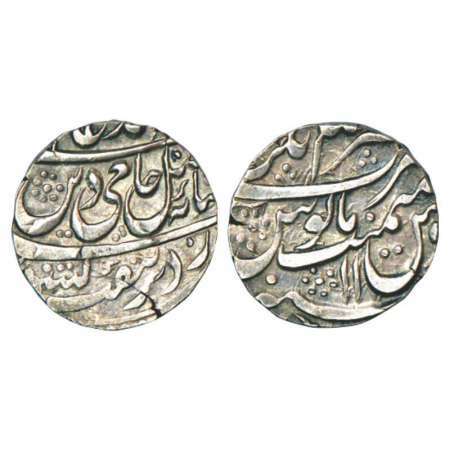 Nizams of Hyderabad, silver 1/4th rupee of Elichpur mint in the name of Muhammad Shah(? ), 2.85g. 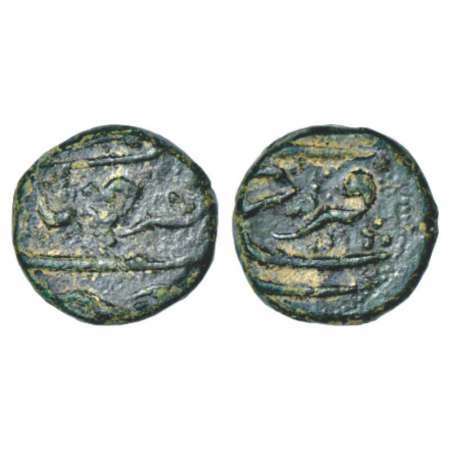 The mint name on this coin is remarkably fully preserved which is a very unusual and rare feature for a fractional issue. 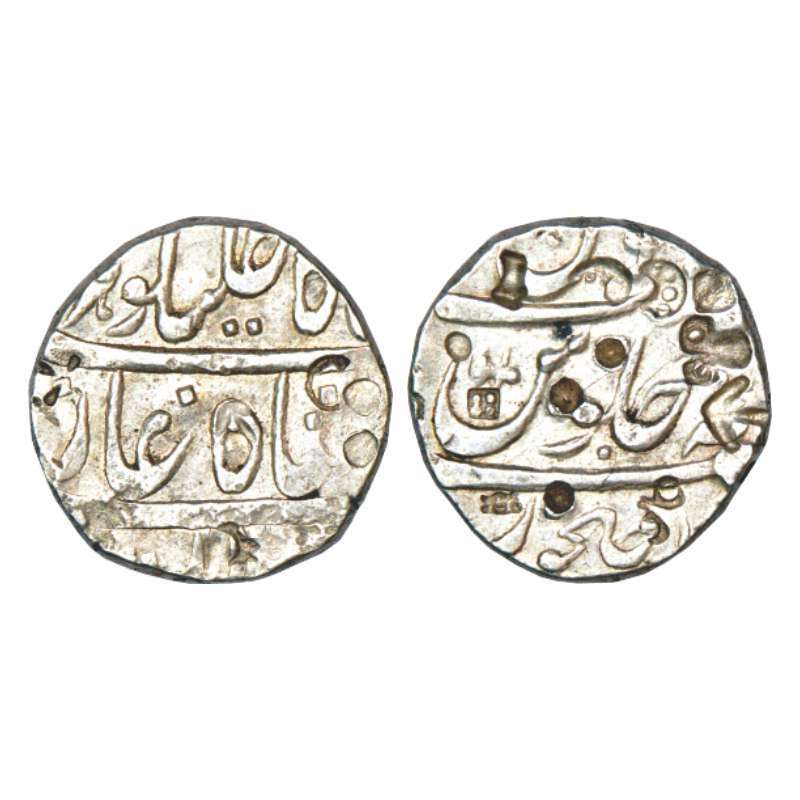 Stylistically the coin appears to be of Muhammad Shah, but Alamgir II is also a likely contender. 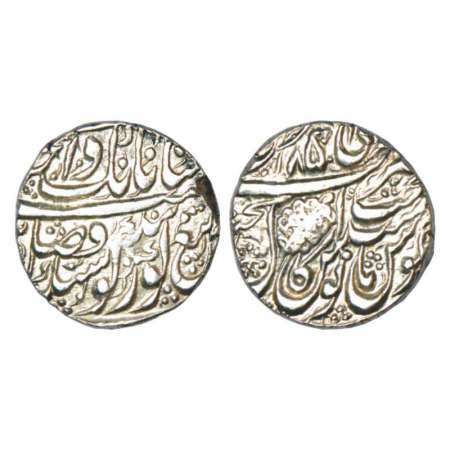 Nizams of Hyderabad, mintless silver 1/32nd rupee in the name of Muhammad Shah, RY 27, 0.34g. 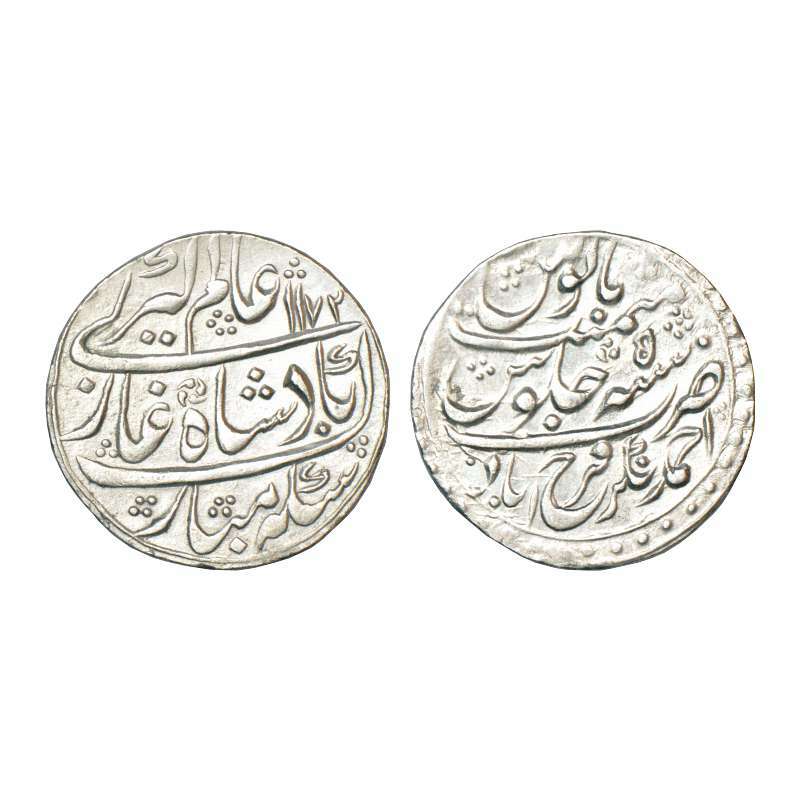 The coin has only Muhammad Shahi written, divided on both sides. It bears no mint, but other coins of similar types are known with mintname Khujista Bunyad. 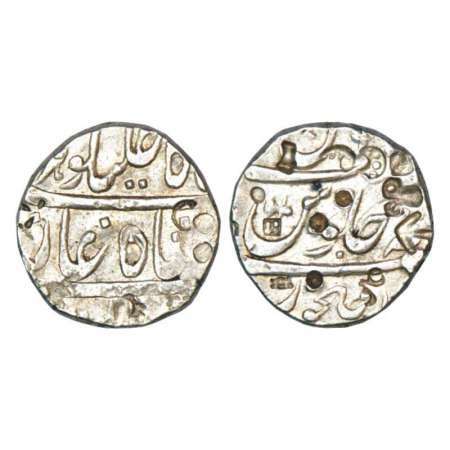 Maratha Confederacy, silver rupee, Muhiabad urf Poona mint (off flan), in the name of Shah Ali Gauhar (Shah Alam II), RY 7, battle axe symbol on reverse, M&W T5. 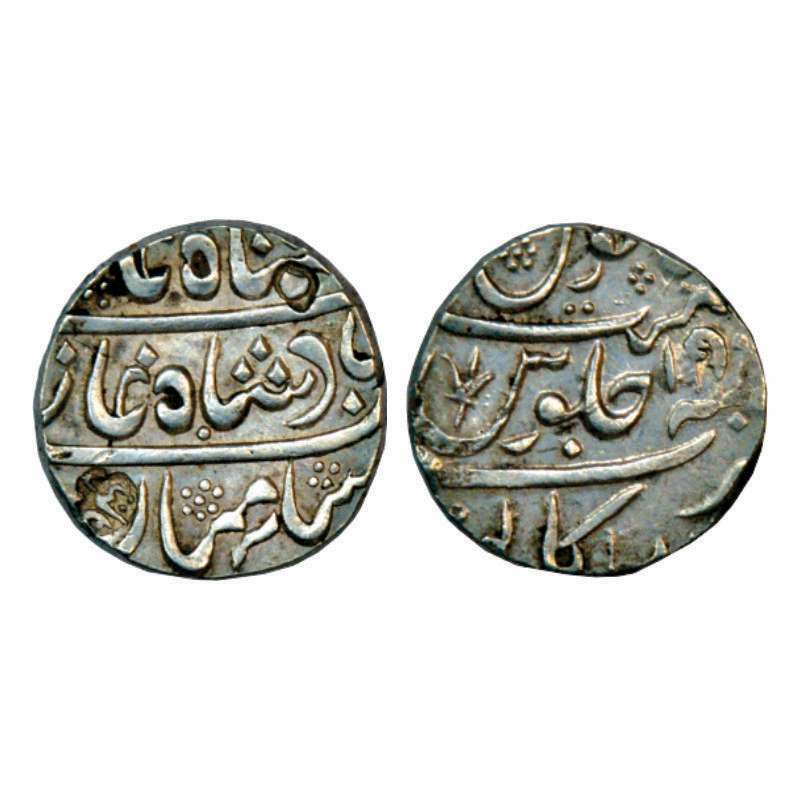 Maratha Confederacy, silver rupee, Nasirabad mint, in the name of Alamgir II, RY 7, M&W T1, shroff marks on both sides. 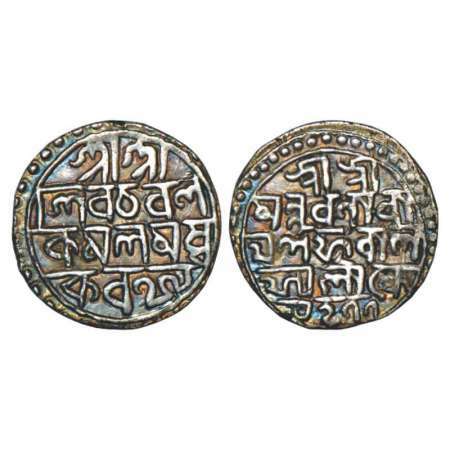 Maratha Confederacy, copper double paisa, 15.19g, Saharanpur mint, in the name of Shah Alam II, AH 120x/RY 40, M&W T3b, mint mark var. 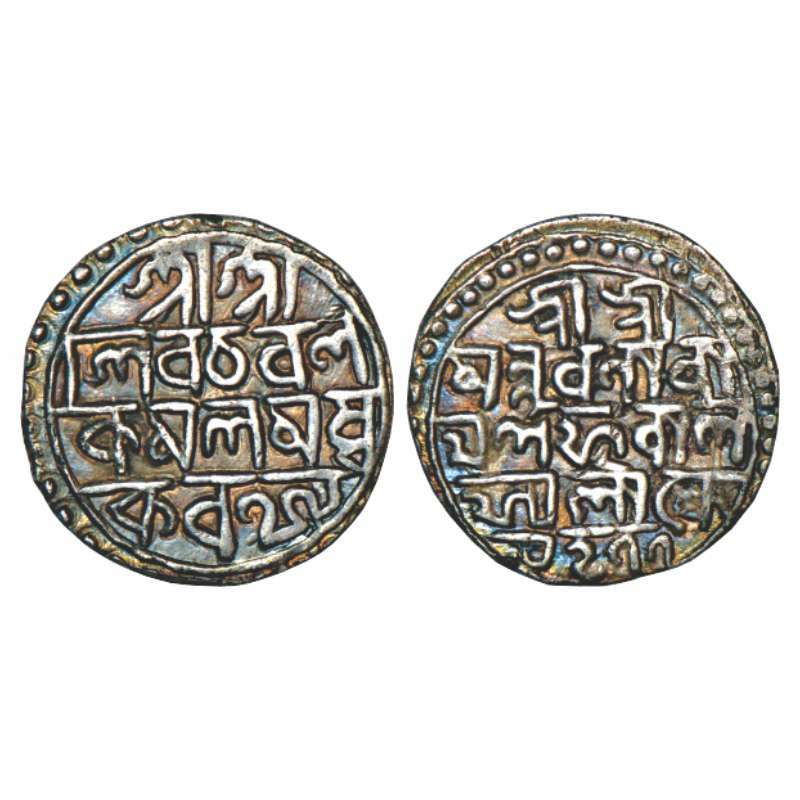 Maratha Confederacy, domains of the Kolhapur Chhatrapatis as overlords of the Senakhaskhel Shinde Torgalkar family, silver rupee, Torgal mint, in the name of Muhammad Shah ba-Lutf Alah Badshah Zaman couplet, mint-name Narsinpur Sarkar Torgal, Trisul mint mark and inverted Nagari Sa on obverse, M&W T1e. 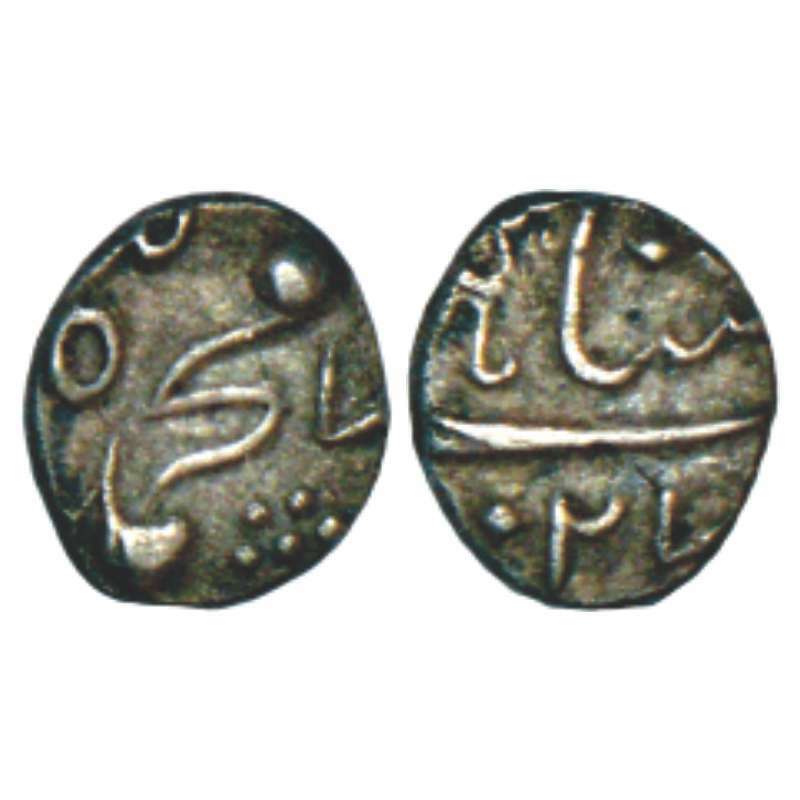 Maratha Confederacy, silver rupee with "Trisul" symbol, copying Arcot rupees with similar designs, Tasgaon (?) 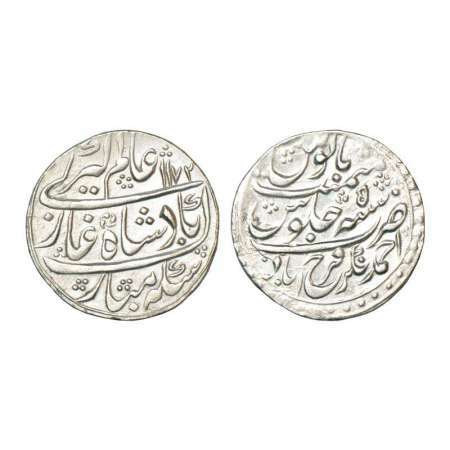 mint, in the name of Shah Alam II, RY19, unlisted in major publications 11.25g. In middle 18th century, the Marathas launched a series of campaigns to exact tributes in the "Carnatic" region. 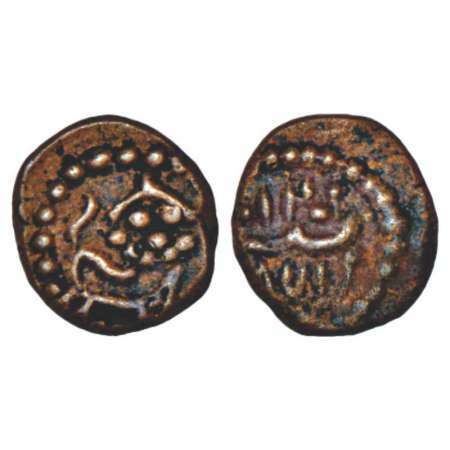 The money that flowed back into Maharashtra as a result of these consisted mainly of Arcot rupees. 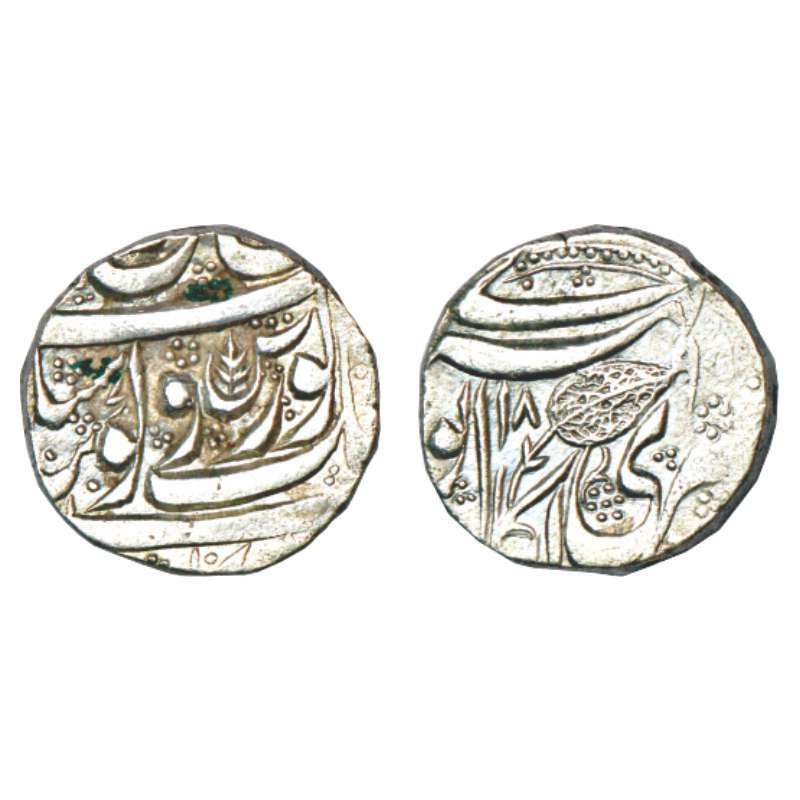 As such the Arcot rupee became a very popular currency in Maharashtra. 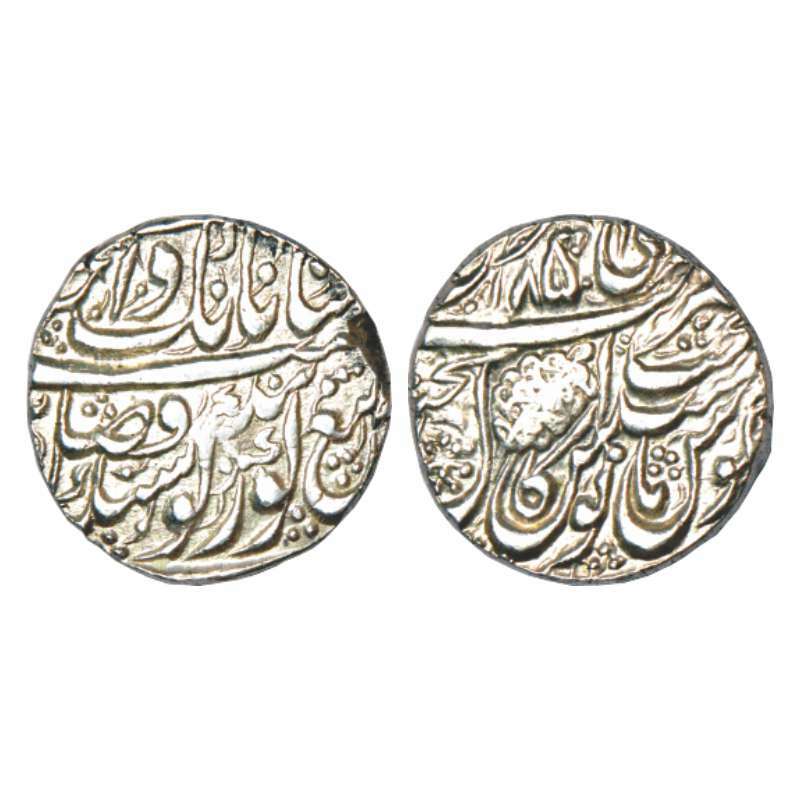 Many mints struck copies with same design sometimes suitably modifying it. A series of Arcot rupees with Trisul symbol is known from Maharashtra with mint name "Arcot". 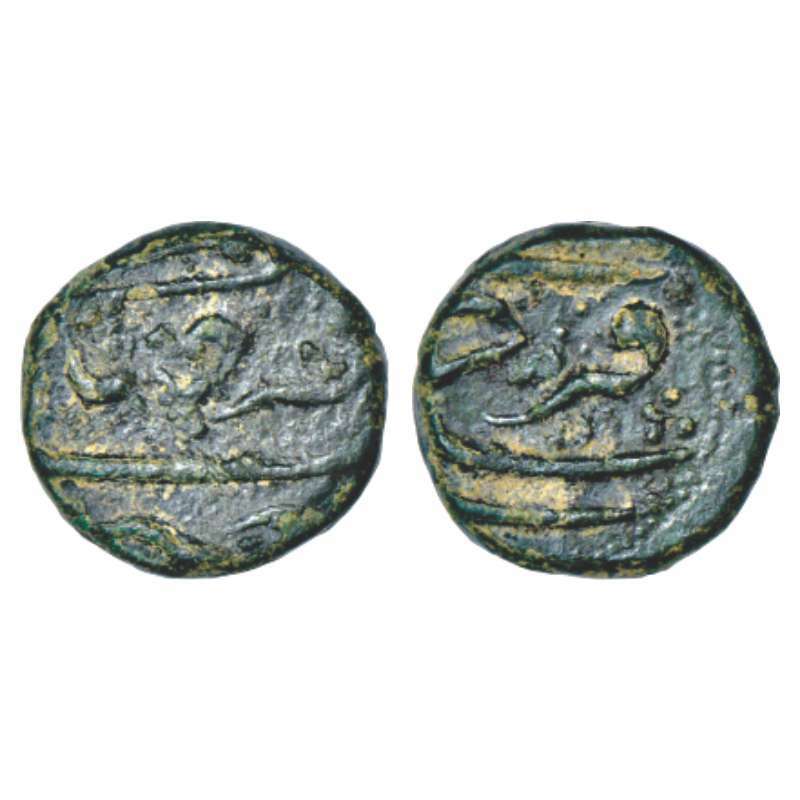 These coins are sometimes identified as "Danish" because of a debatable reference by Uno Berger Janssen. The coin offered here is a direct successor of these coins but the mint name here clearly ends in "- Ganw" (Gaon). The find spots of all these "Trisul" marked rupees broadly overlap with territories held by the Patwardhan sardars who played a crucial role in the "Carnatic" campaigns. 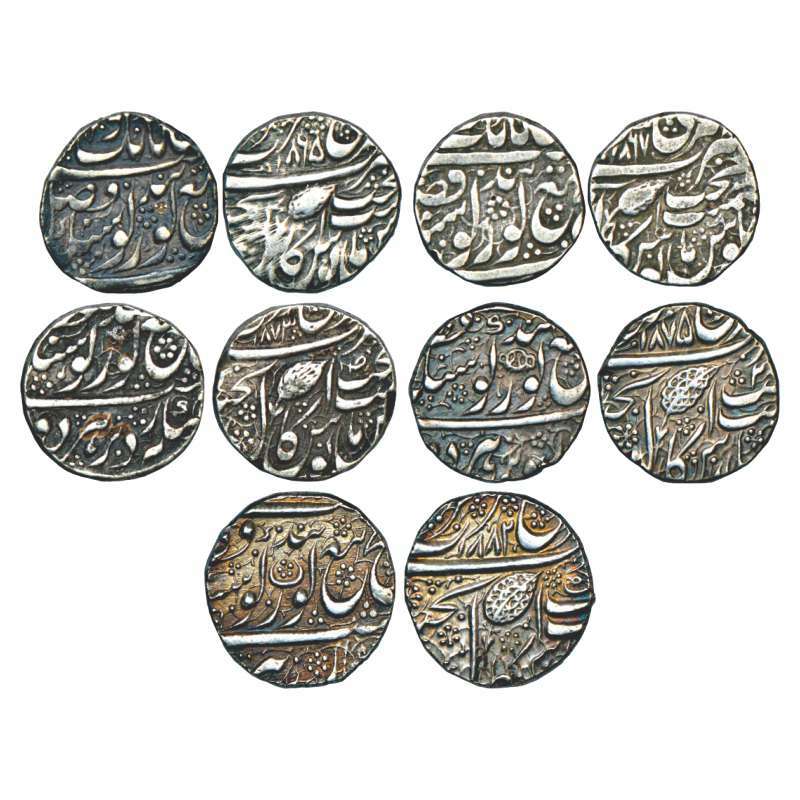 It is plausible that they were instrumental in the Advent and spread of the "Arcot" rupee and its derivatives in the Deccan. 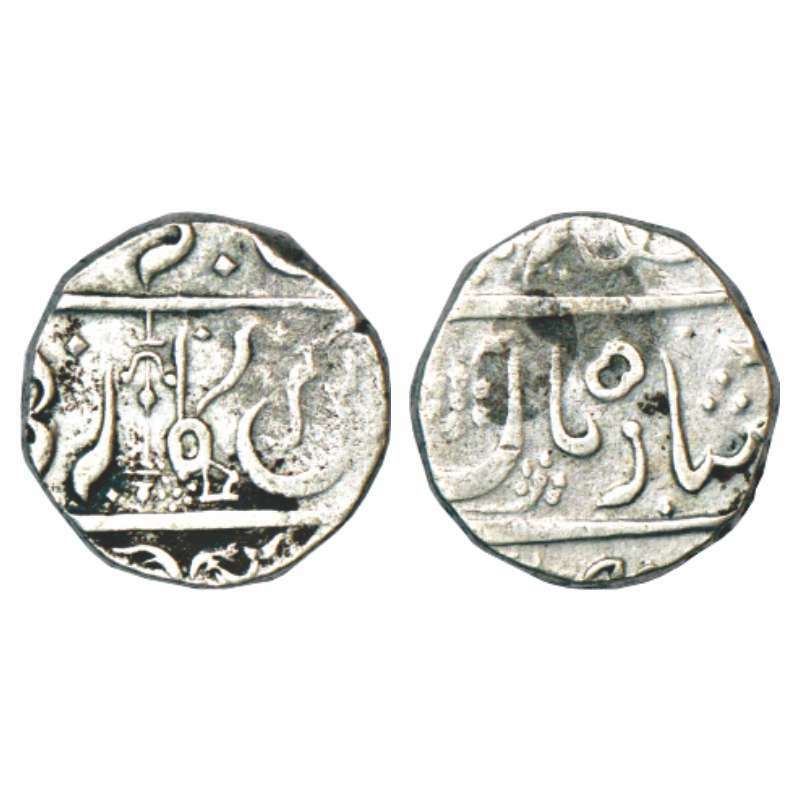 Tasgaon was a major Patwardhan jagir town and it is plausible that this rupee was struck there. 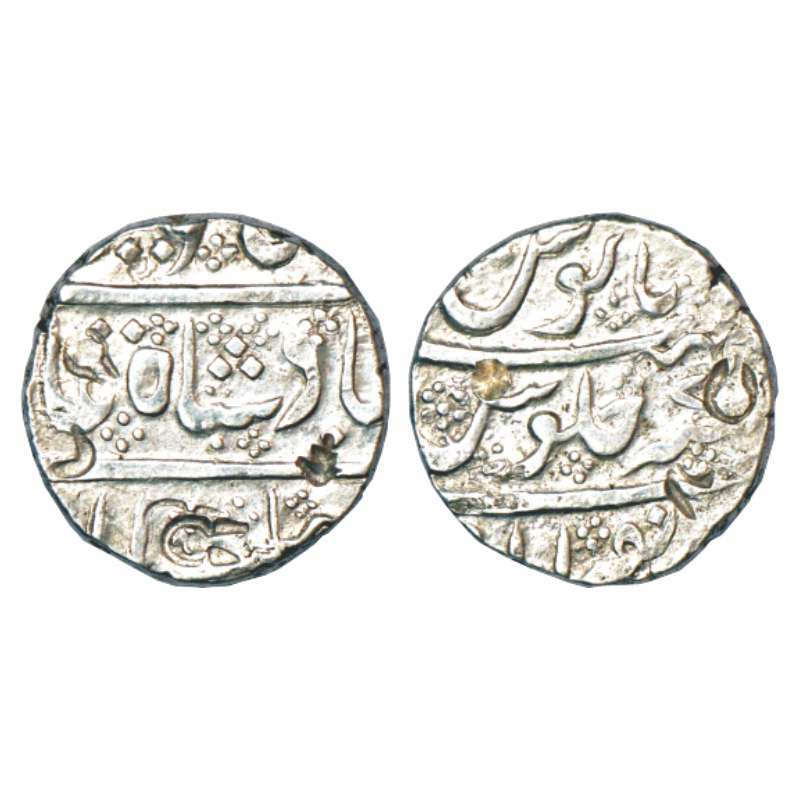 Rohilla Chieftaincies, silver rupee, Bisauli mint (fully visible), in the name of Shah Alam II, AH 1182/RY 10. 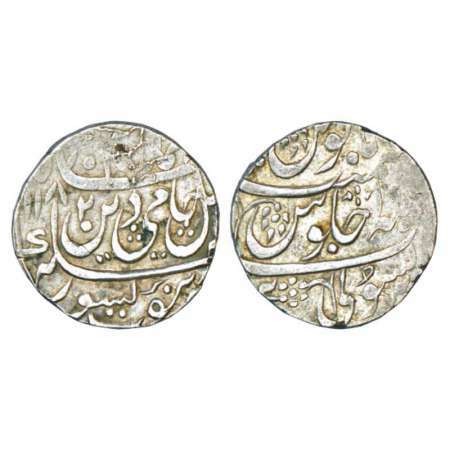 Rohilla Chieftaincies, Nawabs of Rampur, silver rupee of Faizullah Khan (1774-1794 AD), in the name of Shah Alam II, Mustafabad mint, AH 1185/RY 13, 10.96g. The coin has a symbol on reverse which bears an uncanny resemblance with the 'cobra's hood' mark seen on Maratha rupees of Pune mint.However this is entirely coincidental. Rohilla Chieftaincies, silver rupee, Nasrullanagar mint at top, in the name of Shah Alam II, RY 11, KM 106. Die cracks otherwise about extremely fine, Rare. 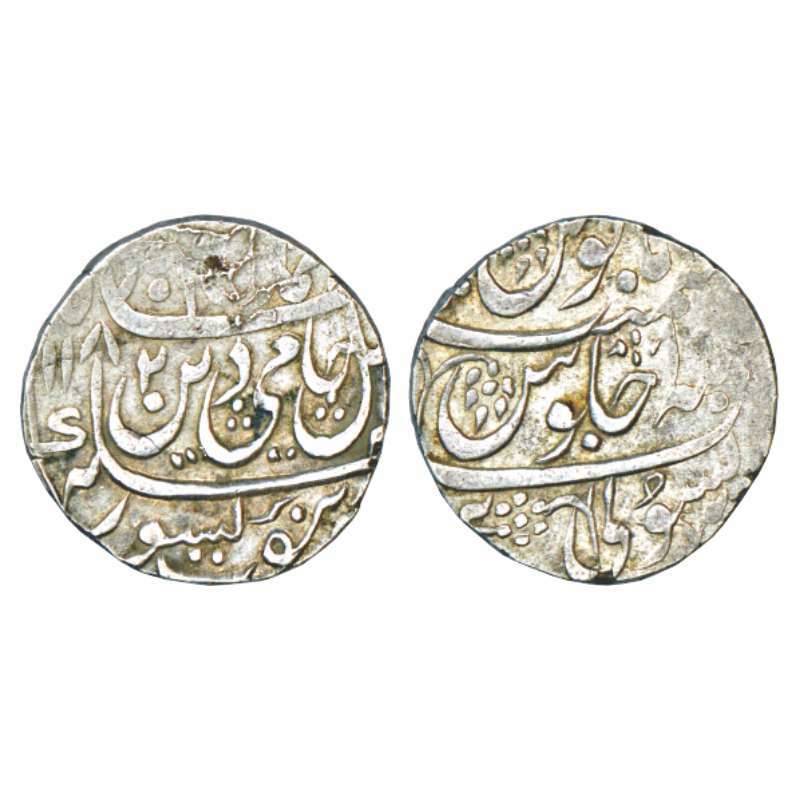 Sikh Empire, Nanak Shahi silver rupee of Misls, Amritsar mint, VS 1850, G. Singh 01.14.01. 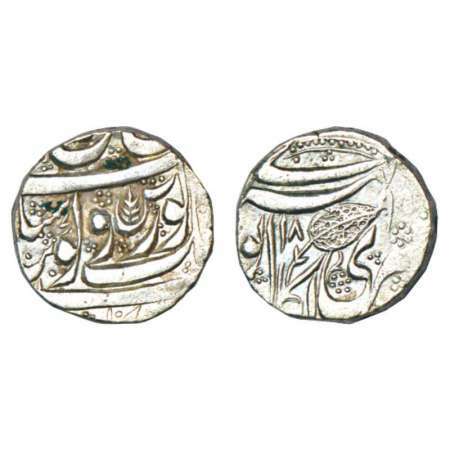 Sikh Empire, Governor Shaikh Gholam Muhyu ad-Din (April 1841-1845 AD), silver rupee, Kashmir mint, VS 1899, Persian Sh for sheikh on obverse, Herrli 06.50.04. 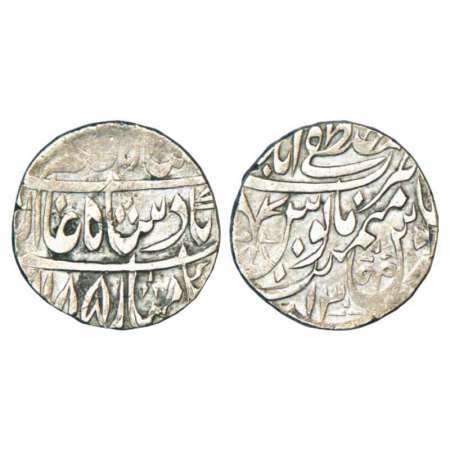 Sikh Empire, silver rupee, Peshawar mint, VS 1892, 8.03g. Obv: 'Gobind Shahi' couplet. 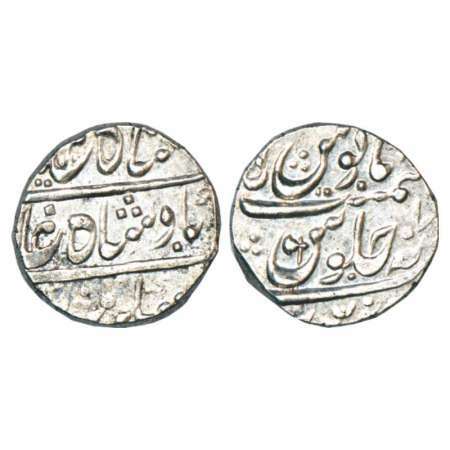 Rev: Dotted leaf, Peshawar rupees were struck in continuation of the last Afghan rupees. Herrli 13.02.04.